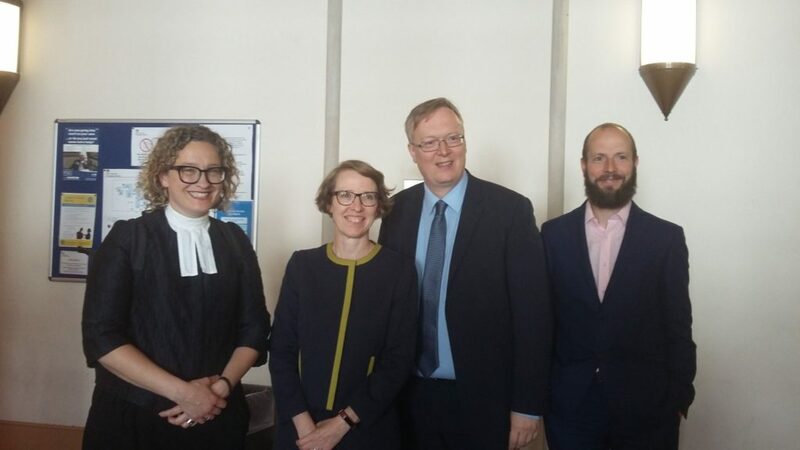 Photo: Barrister Sarah Hannett, solicitor Louise Whitfield, David Buxton and Matthew Smith from the EHRC. We are in no doubt that this case was a major factor which persuaded the government to increase the cap and put in place some mitigating measures for people still affected by the cap. For us pursuing it was the right thing to do. The government’s arguments in this case have confirmed that true motives behind their policies are not about removing barriers and helping each Disabled person to fulfil their potential and pursue their dream career, but to push as many Disabled people as possible into any kind of jobs. The cap punishes people who need expensive support. It bars Deaf BSL users from senior positions and we are disappointed that this was considered to be ok. The case never looked at all the other problems with Access to Work which we know are ongoing and we will carry on campaigning against. Giving judgment today in the High Court, Mr Justice Kerr did not think the Public Sector Equality Duty (PSED) was breached because he believed the whole process was to support disabled people into work. He agreed that Mr Buxton and other Deaf people were disproportionately worse off because of the cap but he thought the increased cap was justified, mainly because he believes it was a legitimate aim to get more disabled people into work even if it meant some people did not get all the support they needed as a result. Mr Buxton has decided not to take this case further in the Court of Appeal as he believes this is unlikely to lead to the end of the cap or better recognition of the rights of Deaf people. Therefore he urges Deaf and disability rights movements to press on Parliament to strengthen the law including the provision of a new BSL Act, and to make the Government reveal the return on investment in Access to Work funding. Mr Buxton’s case was funded by the Equality and Human Rights Commission. ENDS. 1. This statement is issued by David Buxton, the claimant in the judicial review claim; he can be contacted on buxtondc@aol.com. 2. More information on the wider campaign to Stop Changes to Access to Work is available here: https://stopchanges2atw.com/. 3. Mr Buxton was represented by Louise Whitfield of Deighton Pierce Glynn; she can be contacted on 020 7407 0007 and the judgment will be available in due course on the firm’s website at https://dpglaw.co.uk/.